SSC Chairmen has released a notifcation regarding demand raised by SSC candidates against SSC Scam to handle the case to CBI. 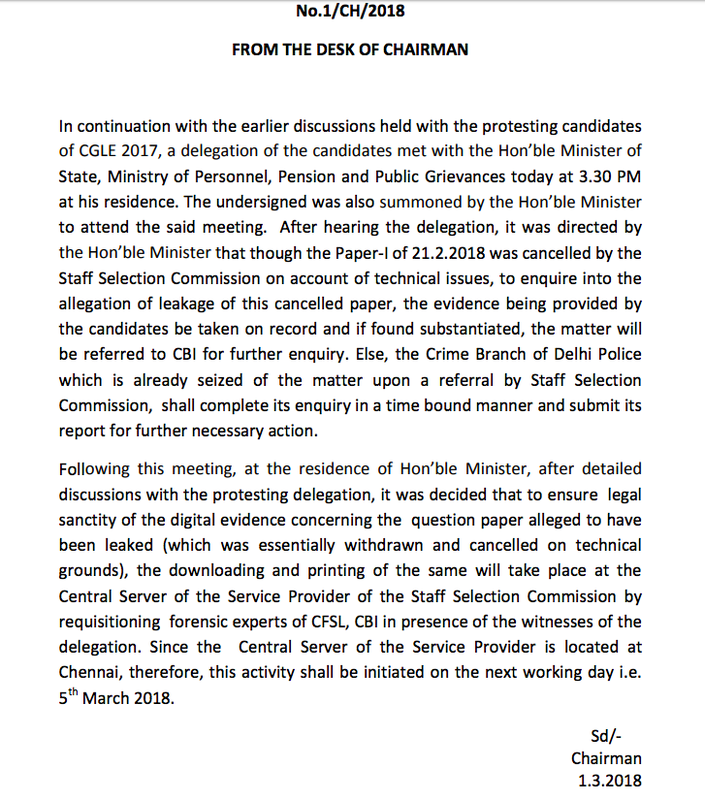 "After hearing the delegation, it was directed by the Hon’ble Minister that though the Paper-I of 21.2.2018 was cancelled by the Staff Selection Commission on account of technical issues, to inquire into the allegation of leakage of this cancelled paper, the evidence being provided by the candidates be taken on record and if found substantiated, the matter will be referred to CBI for further enquiry. Else, the Crime Branch of Delhi Police which is already seized of the matter upon a referral by Staff Selection Commission, shall complete its enquiry in a time-bound manner and submit its report for further necessary action."